Comprehensive Cardiology Consultants has been conducting both pharmacological and device research within St. Mary Medical Center, Langhorne, Pa., since 2003. 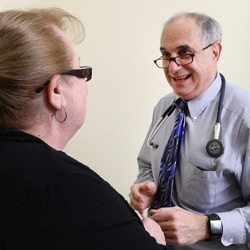 Building on our successful enrollment in more than two dozen clinical trials, our private practice has expanded to include outpatient research trials independent of the hospital. The practice consists of board certified cardiologists, physician assistants, nurse practitioners, and RN research coordinators solely dedicated to clinical trial conduct. Comprehensive Cardiology cardiologists and the research nursing staff are committed to offering our patients the latest developments in cardiovascular disease treatments and therapies. Our mission as a research center is “to promote drug discovery and access to medications for our patients that will lead to a healthier future.” Patients are provided the opportunity to participate in a trial if they meet the necessary entry criteria for that study. Our accomplished staff constantly strives to ensure that our patients are provided with all possible options related to their care. We select trials that have the potential to benefit our patients and contribute to the advancement of healthcare. We strictly adhere to the international standards of “Good Clinical Practice” (GCP) with all research conduct. These standards provide public assurance that the rights, safety and well-being of trial subjects are protected.